■ A holistic approach to uncover nutritional deficiencies, and/or to support a healthy lifestyle. ■ Recommendations and supply of nutritional supplements as needed. ■ Affordable, ongoing nutritional coaching to help your body attain and maintain energy and wellness! e) your commitment to following recommendations resulting from a Customized Nutrition Analysis. 2) The next step represents the core of the Customized Nutrition Analysis. The analysis begins by using manual muscle testing to check the body’s neurological reflexes and acupressure points. Each organ, tissue, or function of the body is tested via its corresponding acupressure point. This technique is noninvasive, requires no needles or blood tests, and has proven very accurate in determining the state of wellness of the entire body. If you are unfamiliar with kinesiology, or manual muscle testing techniques, this process may seem foreign to you. A somewhat simple explanation of this detailed and precise process is as follows. The Customized Nutrition Analysis technician will monitor the lock and release reflex of your raised arm by applying slight resistance. As he or she touches the acupressure points associated with vital organs, tissues or functions, those that are stressed will cause a reduction of energy throughout the body, resulting in a release (weakening) of the raised arm. The Customized Nutrition Analysis allows the experienced technician to both identify stressed areas, and to identify nutrients that may empower the body to relieve the stress and return to a state of wellness. The information gained from a Customized Nutrition Analysis does not constitute medical or health-related advice, and is not intended to diagnose, treat, cure or prevent any disease or health problem. Rather, the Customized Nutrition Analysis is a holistic approach that allows your body to tell us what nutrients it is lacking. The analysis helps remove the guesswork, and all too common, one-size-fits-all approach to recommending a nutritional supplement program. exact nutrients it wants in order to maintain and/or return to a state of wellness. 3) A Customized Nutritional Analysis is an ongoing process. At Energy Equals Wellness, our goal is to help you obtain and maintain a state of wellness using nutritional supplements only as your body dictates, and in as limited a quantity as possible. An ongoing, affordable nutrition-coaching program, based on a Customized Nutrition Analysis, will help correct nutritional deficiencies, and help us identify changing requirements in your nutrition needs. The analysis will also give us insight into, and a path to address, any foods, substances, or other minor issues that are keeping your body from a high state of wellness. Most new Customized Nutrition Analysis clients require 2-3 visits per month in the beginning, with reevaluations of their analysis tailoring off to 3-4 visits annually, or whenever they feel their bodies are not functioning at a high state of wellness. 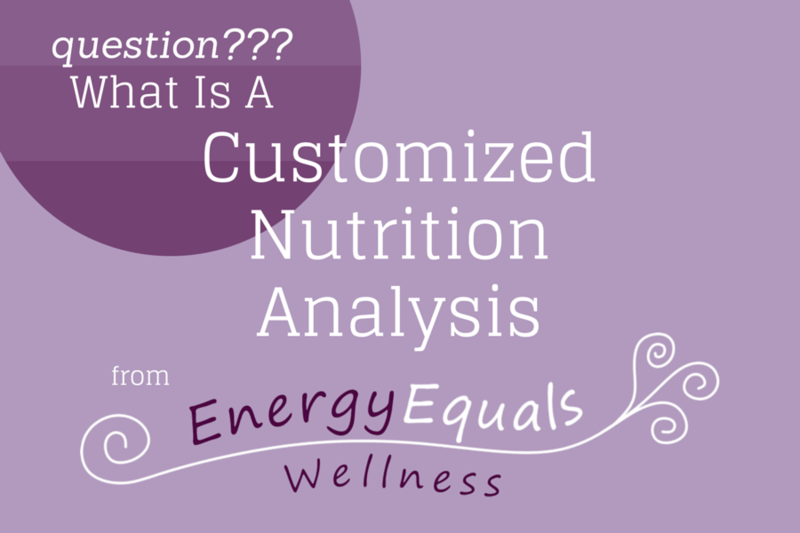 Is a Customized Nutrtion Analysis right for you? The answer to that question may very well be found in the first part of the process. If you are looking for a holistic approach to addressing why you are not feeling your best, if you believe in the body’s ability to heal itself, and you are willing to provide it with the nutrition it requires, then a Customized Nutrition Analysis is a proven way to get on a path towards wellness. We would love to hear from you! Please use our Contact page to ask a question, or if you are ready to begin the Customized Nutrition Analysis process, please call 608-669-2204. Are the nutritional supplements high protein? I have kidney concerns, hypertension and borderline high creatinine, and overweight. Thank you for your question. Other than those supplements specifically formulated as meal replacements, (protein powders, etc.) whole food supplements are not a source of protein. If you have additional questions we welcome you to contact us by email at info@energyequalswellness.com.